Brasov is one of the larger cities in Romania with a population of over 253.000 making it the 7th most populated city in Romania. Brasov is located in the central part of the country about 166 kilometers north of Bucharest and 380 kilometers from the Black Sea. It is surrounded by the Southern Carpathian Mountains and is part of the Transylvania region. The location of the city at the intersection of trade routes linking the Ottoman Empire and western Europe, together with certain tax exemptions, allowed Saxon merchants to obtain considerable wealth and exert a strong political influence in the region. This was reflected in the city’s German name, Kronstadt, as well as in its Latin name, Corona, meaning Crown City (hence, the coat of arms of the city witch is a crown with oak roots). Fortifications were erected around the city and continually expanded, with several towers maintained by different craft guilds, according to medieval custom. Located in the historic center of Brasov, it obtained its right to hold markets in 1520, but it has been the place for annual markets since 1364, being visited by merchants from the country and abroad. The houses surrounding the square are historic. Today the square is filled with a number of places to eat and drink all of which have terraces in the summer. Many events take place here also, concerts, festivals, marathons etc. Built in the 13th century, the house served as a meeting place for the town councilors, known as centurions. On top of the building sits the Trumpeter’s Tower, used during the Middle Ages as a watchtower for warning the citadel inhabitants of any approaching dangers. 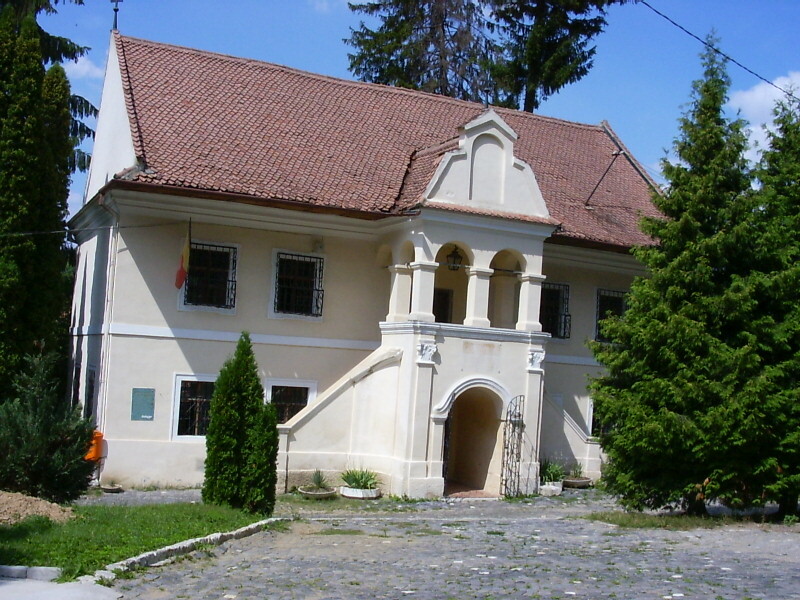 Today the old city hall houses the Brasov County Museum of History. Built between 1385 and 1477 on the site of an earlier church (destroyed by the mongol invasion in 1242), the construction Marienkirche, as it was known in German, was hampered by extensive damage caused by Turkish raids in 1421. The church was given its new name after disaster struck again in 1689, when the Great Fire leveled most of the town, blackening the walls of the church. Restoration took almost 100 years. The Black Church is the largest gothic church between Vienna and Istanbul and boasts the largest church bell in Romania, weighing in at seven tons. 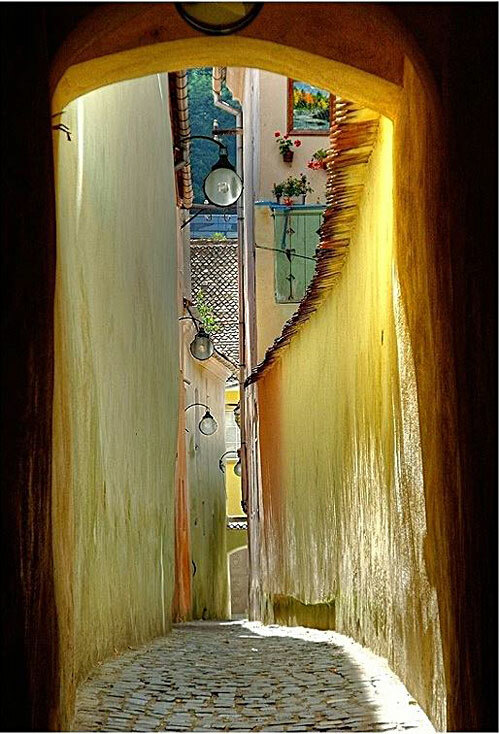 This is the narrowest street in Brasov and it is believed to be one of the narrowest streets in Europe. The Rope Street is approximately four feet wide and it links Cerbului Street with Poarta Schei Street. It was initially used as an access route by firefighters. 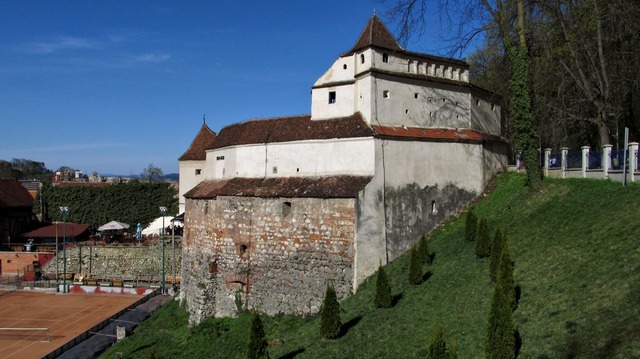 Built during 1421-1436 and rebuilt in 1570-1573, this is the largest bastion in Brasov and the best-preserved among the seven original watchtowers constructed around the city walls. Today, the Weavers’ Bastion houses an interesting museum that can be visited on the way up Tampa Mountain. Above the Weaves’s Bastion, along the southeastern side of the fortress walls, is a very romantic alley (Aleea Tiberiu Brediceanu), shaded by old trees and dotted with many benches. From here, you can hike or take the cable car to the top of Tampa Mountain, where the original defensive fortress was built. Built in 1559 by the Tailors’ Guild, is the only original gate to have survived from medieval times. Its four small turrets symbolize the fact that the town had judicial autonomy, and the “right of sword”, which was the right to decide on capital punishment. At the present time there is a museum here. The structure standing today was built in 1827 by Emperor FRANZ I , and replaced the old Schei Gate witch had been heavily damaged by fires. The gate resembles a triumphal arch with three openings. Strategically located on a hill overlooking the town and the plains to the north, the citadel was part of Brasov’s outer fortification system. Built in wood in 1524, it was replaced with a stone structure in the 16th century, only to be abandoned in the 17’th century after technological innovations made cannons stronger than the building. Today, it serves as a restaurant. The tower received is name from a severe fire in 1559 when it was struck by lightning. The Black Tower houses a small collection of war related artifacts. There are four floors, climb all the way to the top for a panoramic view of the Black Church. Located high on a hill, you’ll have to climb some 200 stairs to reach it. This tower offers a great view of the old town. The First Romanian School is also located in the Old Center of Brasov (Schei) and it was built in the 14th century. The building is a real historical monument, being the home of the first Romanian Bible, the only school in Transylvania, being endowed with the first Romanian printing press, plenty of books being printed here. 13. Fine dinning, traditional Romanian food and everything in between. Mountain adventures, quirky pubs and charming cafes.